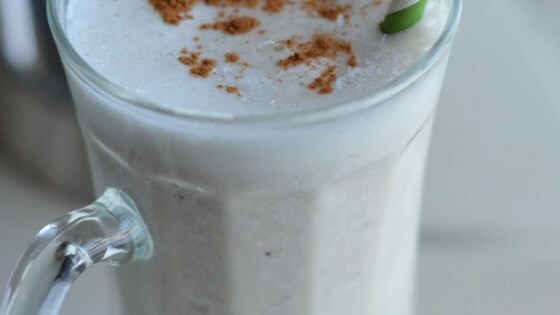 "This is a delicious milkshake to try if you don't have a lot of time or ingredients! The cinnamon and sugar can be omitted." Put banana, milk, ice, sugar, and cinnamon in a blender; puree until smooth. Tastes a lot of banana. I would've added a 1/2 cup of more milk for a milkshake feeling. I made this a lighter banana milkshake by using Truvia instead of sugar. I used a frozen banana and omitted the ice. Delicious! Add a tablespoon of Nutella!!! This was quick and easy. I omitted the sugar and added a drop of vanilla and it became an instant hit for my kids! Thanks!